Given that there is now official confirmation (Finally! After the quagmire of all these unofficial reports*) that Syria's home fixture will indeed be held in the Hang Jebat Stadium, Melakka/Malacca, Malaysia,^ I thought we should take a quick look at the odds# for this match. 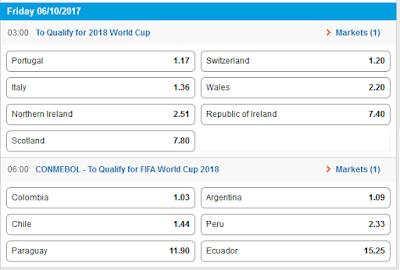 The road to Russia will not be easy, despite Sportsbet's generous odds in Australia's favour. For the Malaysian leg, Sportsbet has us at $1.67 for the win and the Qasioun Eagles at $4.50 for the win. 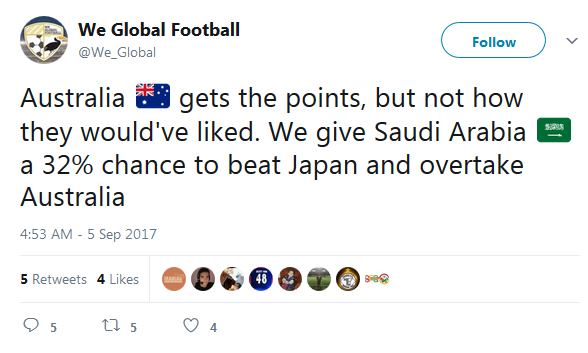 However, We Global Football suggests the line is a lot closer. In both legs, it is predicted that the game will be decided by 1 or less goals. I'm inclined to think that this latter view is about right. Syria will be a tougher, grittier, more enhanced version of Thailand and Iraq. It's important to remember that they were undefeated in their home away from home in Malaysia. 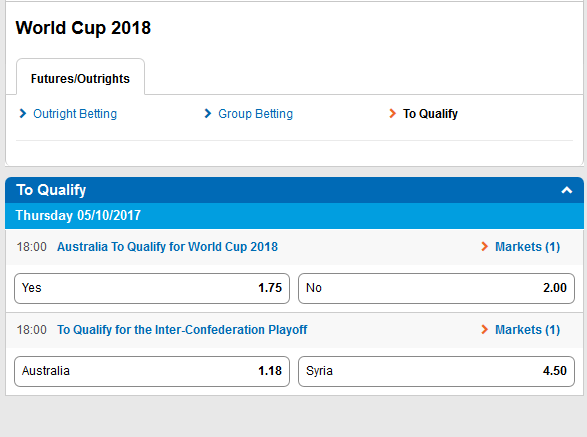 Syria's ability to grind out a draw will be accentuated if rain invades the pitch and/or the pitch is difficult to play on. This is entirely possible given that the monsoon season in Malacca apparently occurs in March to April and October to November. Of course, the result in the first leg will decide both teams' approach in the second leg. 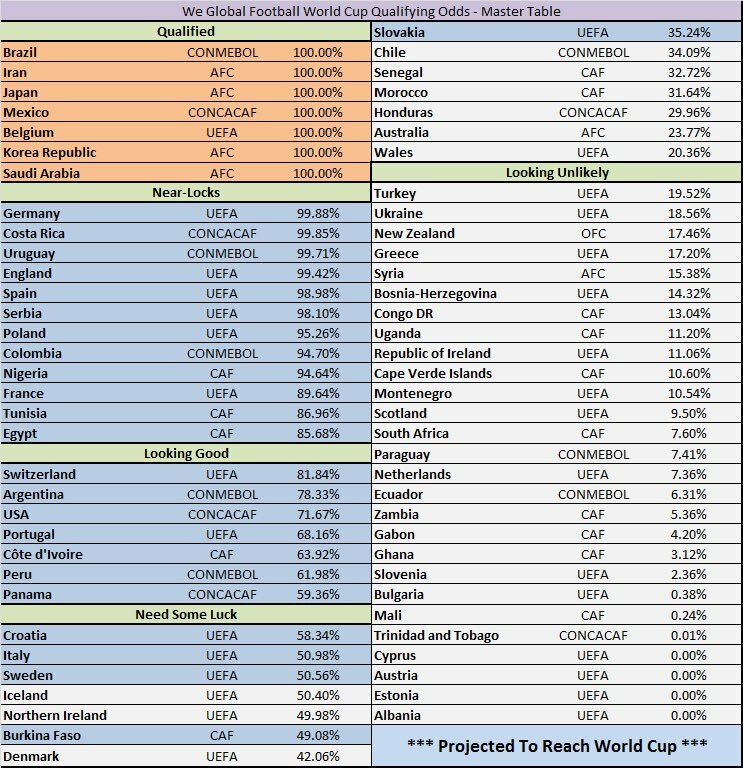 These statistics are somewhat depressing; they reveal that we blew a big opportunity to qualify automatically by being top 2 in the group. 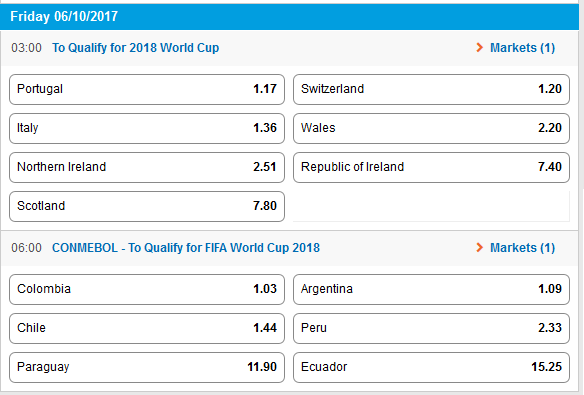 SportsBet seems a bit more optimistic, giving us $1.75 to qualify for the 2018 FIFA World Cup (roughly a 57% chance). Although 'No' is priced at $2.00, which is not too different. We Global Football suggests that, for the CONCACAF and AFC playoff, the most likely matchup is between Australia and Panama. Although I think USA v AUS or USA v SYR would look very interesting. 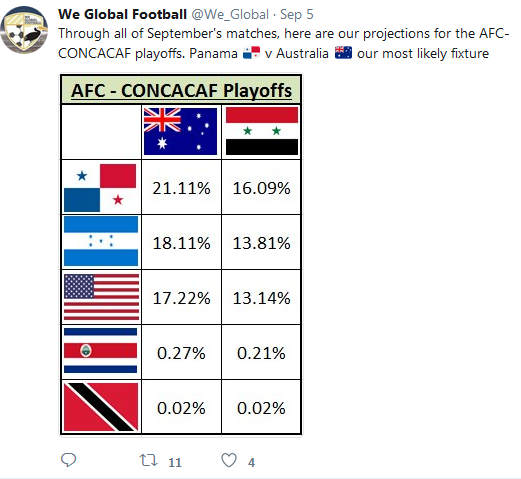 I am actually secretly hoping for an AUS v USA playoff, even though this means we probably will not qualify if that occurred. We Global Football goes one step further and backs Panama and USA (hence, not Australia) to make it to the World Cup as per the below table. 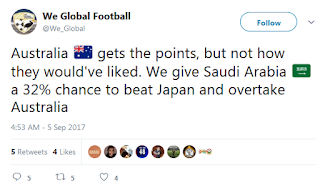 Update: On Friday, ESPN's Soccer Power Index threw a spanner in the works and predicted that Australia would go through to the World Cup. 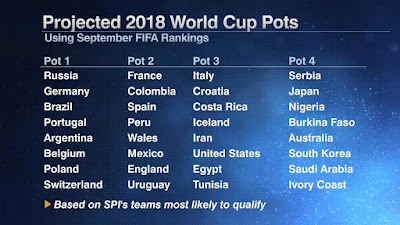 Interestingly, FIFA also told us that the draw would operate on the basis of seeded (rather than geographical) pots based on October 2017 FIFA ranking only. The best 7 teams plus the hosts will be placed in Pot 1, then the next best 8 teams are in Pot 2 and so on. A team is picked from each pot to form a group. A group can't contain two teams from the same confederation with one exception: a group is able to have up to two teams from Europe, presumably because they have the most representatives. 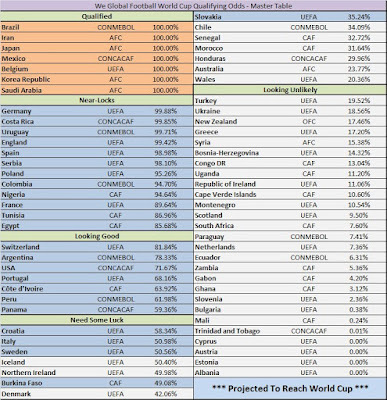 This is a radical overhaul and departure from FIFA's previous practice where, apart from Pot 1 (which was also seeded based on FIFA ranking), all remaining unseeded teams from the same geographical region or confederation were each placed into the same pot to ensure maximum geographical separation (there were other complexities because each confederation had different numbers of teams. Sometimes groups from two regions were merged). 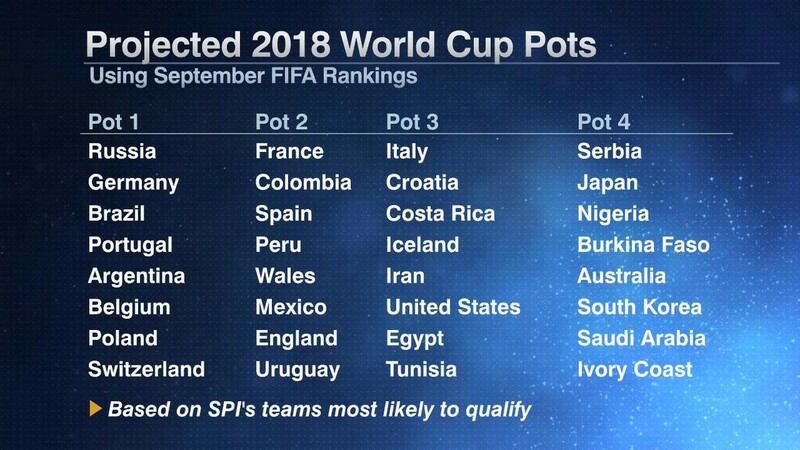 So if I remember correctly you could have one pot with Asia and Concacaf, one pot for Africa and South America and one pot for Europe. 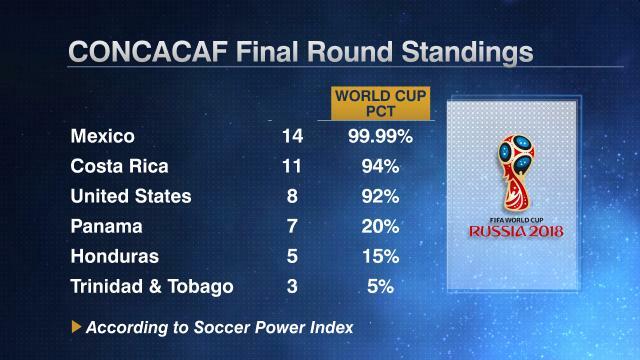 Funnily enough, ESPN had given the USA a 92% chance of qualifying before the matches against Costa Rica and Honduras. 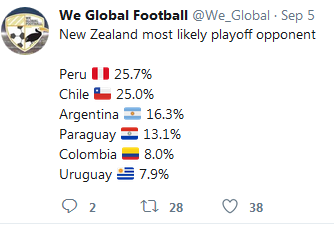 According to We Global Football, NZ looks most likely to play Peru or Chile. 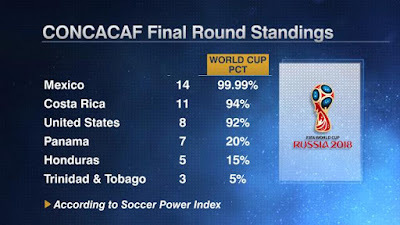 And Paraguay and Ecuador are outsiders in CONMEBOL. * It's been reported that the FFA wrote to FIFA complaining about the delays in finalising Syria's home leg. This supposedly caused FIFA to intervene and set a deadline for Syria. This makes sense, given that the first leg is due to be played in exactly three weeks!! ^ Why does Malaysia want to host these World Cup Qualifiers? "Malaysia wants to show they’re the centre of Islamic finance, a progressive country,"
“Qatar sees itself as an alternative to Abu Dhabi and the Saudis – this is about flexing the muscles and showing supremacy." #Disclaimer: These odds are purely for probability discussion purposes. Generally speaking, I don't gamble or bet.